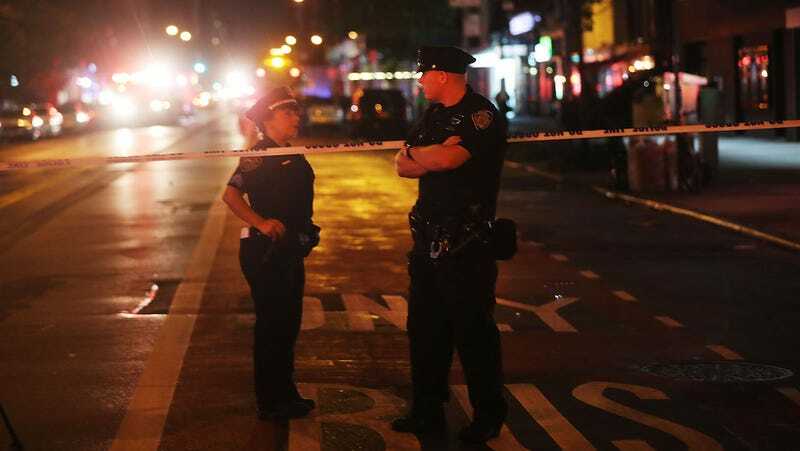 At approximately 8:30pm on Saturday night, an explosion shook Manhattan near 23rd St and Sixth Avenue. The New York Police Department and Fire Department are on the scene but haven’t yet confirmed the cause. So far, there are 25 reported injuries and no fatalities. Update 9/18, 9:30am: Authorities believe the blast was caused by a homemade bomb and a second explosive device was found hours later a few blocks away, according to the New York Times. A police source told the Times the second device was a pressure cooker that looked like the one used in the 2013 bombing at the Boston Marathon. As of the Sunday morning, 29 people have been reported injured. New York City Mayor Bill De Blasio said at a press conference later in the evening that the explosion was “an intentional act” but did not link it to an act of terrorism. Initial reports claim that the explosion came from a dumpster. It remains unclear whether the explosion was actually caused by a bomb. Earlier in the day, a pipe bomb exploded near a 5K run in Seaside Park, New Jersey. That device was apparently planted in a trash can. No injuries were reported in New Jersey, and authorities do not yet know if the Chelsea explosion is related.